This event is intended for participants who identify as Womxn (Transgender, Cis-gender, Non-Binary) and Trans & Gender Non-Confirming People. Spectators of all genders and ages are welcome -- free admission/no registration required. Spectators are asked to stay in spectator sitting area (bleachers) for your safety. Spectators under the age of 12 must be accompanied by a parent/guardian at all times. I have skated at BAD Park before. I have not skated at BAD Park before and I have experience and feel comfortable skating on ramps I have not skated at BAD Park before and I do not have experience skating on ramps. I hereby authorize and give permission, that myself / the participant may be given emergency treatment including first aid and CPR by qualified Skate Like a Girl staff and volunteers. I also give permission for myself/my child to be transported by ambulance and to be treated by any physician, hospital, health care provider, or other medical personnel selected by the staff of Skate Like a Girl to provide prompt medical services. 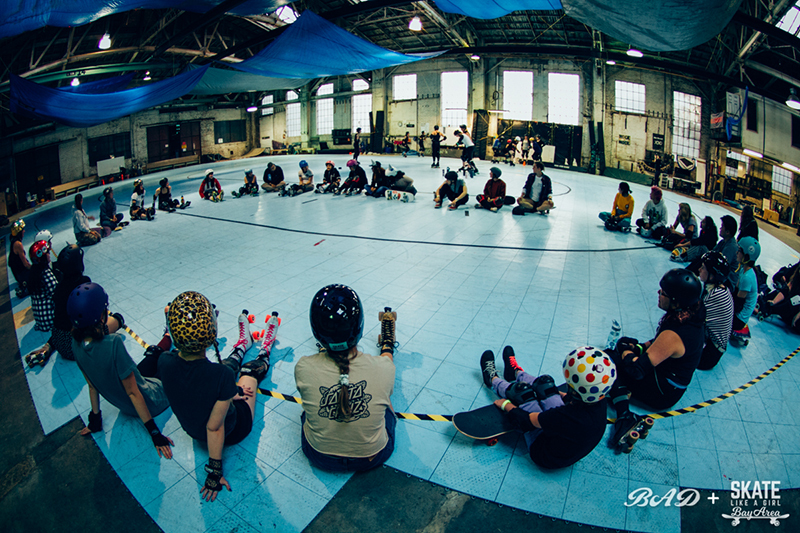 I agree that once the participant is in the care of medical personnel or a medical facility, Skate Like a Girl shall have no further responsibility for the participant and I agree to pay all costs associate with such medical care and transportation. In the event that I cannot be contacted, I further authorize consent to the medical, surgical, and hospital care treatment procedures to be performed for myself/my child by a any physician, hospital, health care provider, or other medical personnel selected by a Skate Like a Girl staff when deemed necessary or advisable by the medical personnel to safeguard the participant’s health. I wave my right of informed consent to such treatment. 4. For myself and on behalf of my/our heirs, assigns, personal representatives and next of kin HEREBY RELEASE Skate Like a Girl its officers, officials, agents, and/or employees, other participants, sanctioned events, sanctioned organizations, volunteers, sponsoring agencies, sponsors, advertisers, and if applicable, owners, leasors of premises used to conduct the event (Releasees), WITH RESPECT TO ANY AND ALL INJURY, DISABILITY, DEATH, or loss or damage to person or property incident to my involvement or participation in these programs, WHETHER ARISING FROM THE NEGLIGENCE OF THE RELEASEES OR OTHERWISE, to the fullest extent permitted by law. I assume all risks, and hazards incidental to participating in the activity and do hereby waive, release, absolve, indemnify, and agree to hold harmless Skate Like a Girl, their supervisor, participants and instructors for any claim arising out of any injury to myself or the participant. 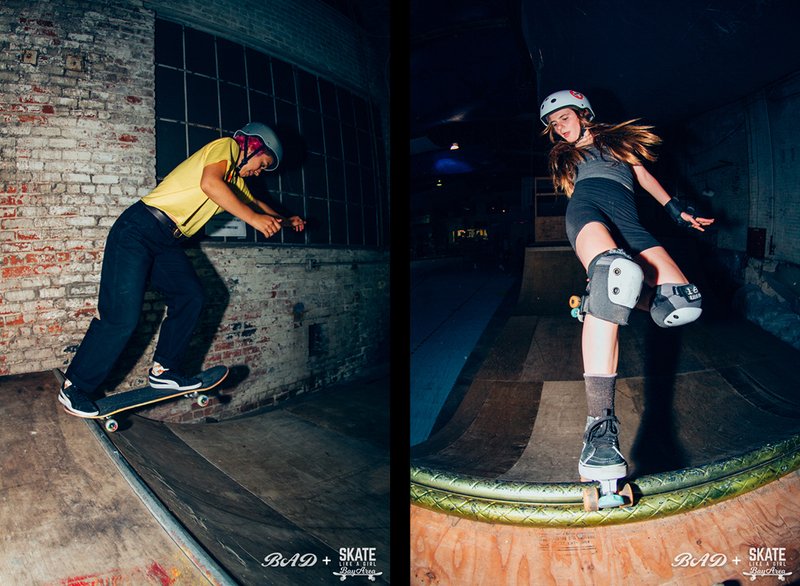 I grant full permission to use any photographs, videotapes, motion pictures, recordings, or any other record of me or my child in this program for promotion of Skate Like a Girl. We require a clinic fee per participant, though no one will be turned away for lack of funds. Fees cover BAD Indoor Park expenses, clinic expenses, coach payroll, keeping our loaner equipment in good condition, help support other Skate Like a Girl programs, and provide scholarships to keep our programs as accessible as possible. 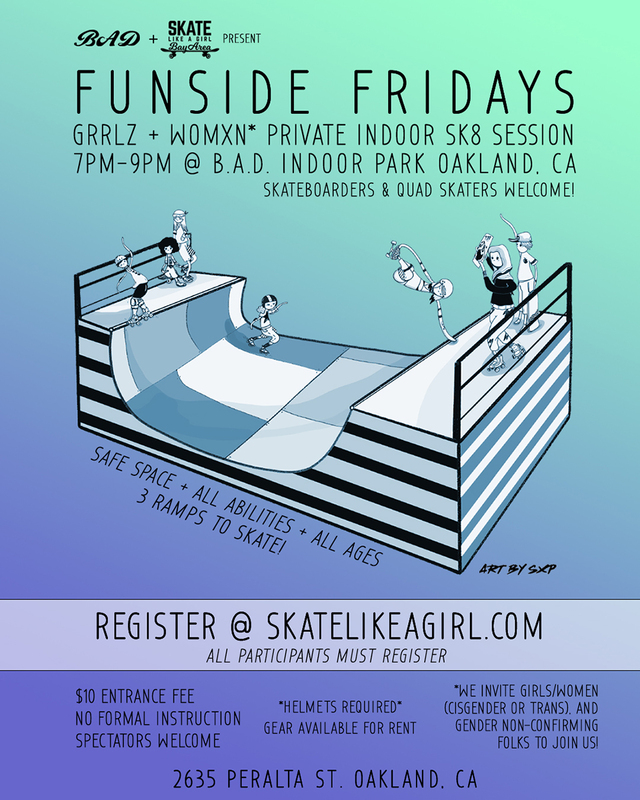 If you would like to request financial assistance to participate please email us at sfbay@skatelikeagirl.com with the subject line "SF Bay Clinic Financial Assistance" 72 hours prior to the event date. Credit Card Registration is NON-REFUNDABLE. If you miss the event or cannot attend, the credit can be applied to a future Funside Friday. In rare cases of excessive rain, we reserve the right to cancel this event. Cancellations due to weather will refund participants in full. Subscribe for information on future programs and opportunities. You will be contacted via email with camp reminders and information, as well as if there are any cancellations or updates due to weather or other factors.